This text is also available with MyWritingLab – an online homework, tutorial, and assessment program that provides engaging experiences for teaching and learning. Flexible and easily customizable, MyWritingLab helps improve students’ writing through context-based learning. Whether through self-study or instructor-led learning, MyWritingLab supports and complements course work. 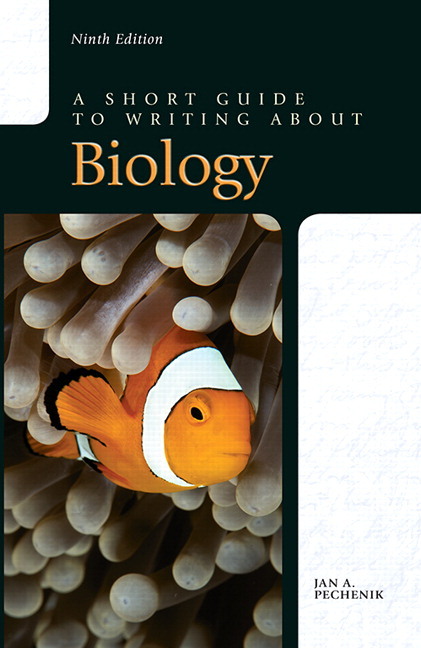 Offers extensive guidance for all aspects of writing for biologists at all stages of training, including research reports, essay exams, term papers, research proposals, summaries, critiques, poster presentations, oral presentations, and letters of application for jobs and graduate programs. Includes extensive pedagogy in each chapter—helpful hints and end of chapter checklists and summaries facilitate peer review and help instructors to generate grading rubrics. Explains how biologists work, design studies, and think about the data they collect (Ch 1 and throughout). Provides detailed advice on working with data, presenting data, and interpreting the results of statistical analyses (Ch 3 and 4). REVISED! An expanded section on avoiding plagiarism (Ch 1 and 3). REVISED! Updated drawings clarify how to read figures and interpret data (Ch 3). REVISED! More information about citing references and listing them in the Literature Cited section of reports, including information about adding DOI’s (digital object identifiers) to references and how to cite online journals (Ch 5). Guides students through the important process of creating effective oral presentations and poster presentations (Ch 11). NEW! Offers advice on organizing talks and giving regular, short oral presentations in class based on a single graph or table from a research paper Ch 11). 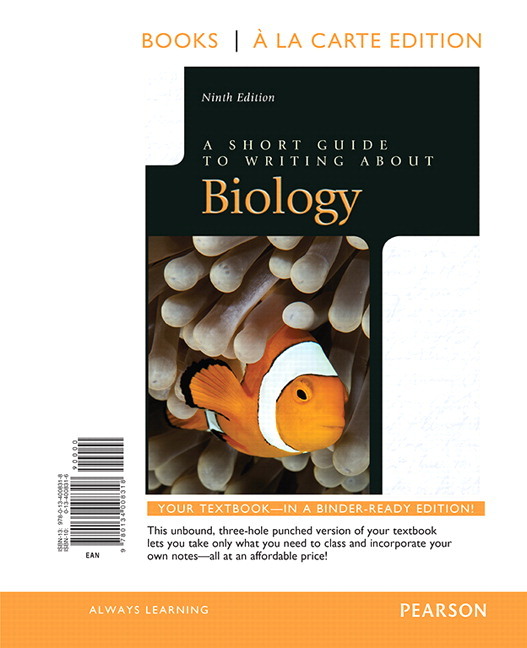 Includes numerous “Technology Tips,” helping students to take better advantage of the computer technology available to them for writing, revising, graphing, calculating, and giving effective talks (throughout). NEW! Features information on how to address controls and write a good Materials and Methods section of a laboratory report of research paper (Ch 9). NEW! Includes material about preparing manuscripts for online submission (Ch 9). NEW! Features content on writing effective figure captions (Ch 9). NEW! Offers examples about building logical introductions that lead to the specific research question to be addressed (Ch 9). Begins each chapter with a brief overview of the main points to be covered in that chapter to let students know the key topics that they are expected to learn. NEW! Includes more boldfacing, making it easier for students to locate advice of particular importance. Writing at the Center. With the new composing space and Review Plan, MyWritingLab unites instructor comments and feedback on student writing with targeted remediation via rich multimedia activities, allowing students to learn from and through their own writing. Writing Help for Varying Skill Levels. For students who enter the course under-prepared, MyWritingLab identifies those who lack prerequisite skills for composition-level topics, and provides personalized remediation. Proven Results. No matter how MyWritingLab is used, instructors have access to powerful gradebook reports, which provide visual analytics that give insight to course performance at the student, section, or even program level. 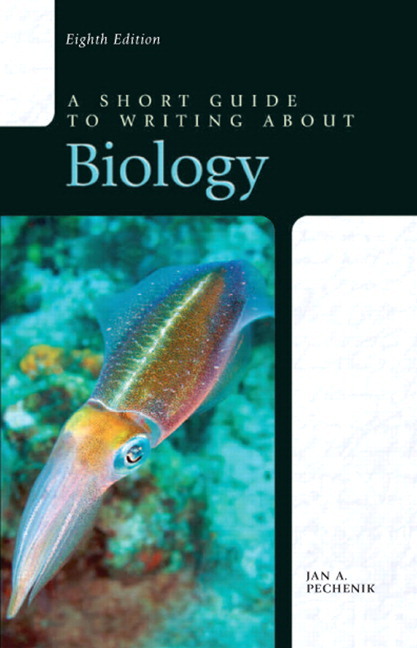 Features an expanded section on avoiding plagiarism (Ch 1 and 3). Includes updated drawings that clarify how to read figures and interpret data (Ch 3). Provides more information about citing references and listing them in the Literature Cited section of reports, including information about adding DOI’s (digital object identifiers) to references and how to cite online journals (Ch 5). Offers advice on organizing talks and giving regular, short oral presentations in class based on a single graph or table from a research paper Ch 11). Features information on how to address controls and write a good Materials and Methods section of a laboratory report of research paper (Ch 9). Includes material about preparing manuscripts for online submission (Ch 9). Features content on writing effective figure captions (Ch 9). Offers examples about building logical introductions that lead to the specific research question to be addressed (Ch 9). Includes more boldfacing, making it easier for students to locate advice of particular importance.